The Continuing Labour of Care – who speaks and acts? It’s been a full year of practicing critical librarianship and digital pedagogy on U-M campus and beyond. As I reflect on my academic involvements since starting this position in January of this year, I find myself returning to the notes above, feeling ever so grateful for this community whilst also remaining attentive to unique structural barriers that lay ahead. Connection, care, critique, and capacity building have been key in the political aspect of my public scholarship career, and this year-end post is in equal parts a documentation of and a commitment to those values as I prepare for 2019. Organized around core responsibilities in teaching and community building, the following six areas cover select engagements that made this year deeply fulfilling and transformative for me. These areas include: 1) open workshop series; 2) course-integrated pedagogy; 3) public initiatives and events; 4) co-curricular and curricular collaborations; 5) research and writing projects; and 6) communities and forums. Individually and collectively, these involvements have been extremely generative in terms of establishing new and previously unexplored project-based connections with members on campus. The continuing invitations to partner with faculty in classroom projects, and equally, to engage departmental heads in thinking about the role and value of digital scholarship and pedagogy librarians in academic initiatives are a few such examples. In this post, I also want to give a special shout-out to Anne Cong-Huyen, my academic partner in Connected Scholarship. Anne and I started on the same day, in the same position, and with the same title in the Library. 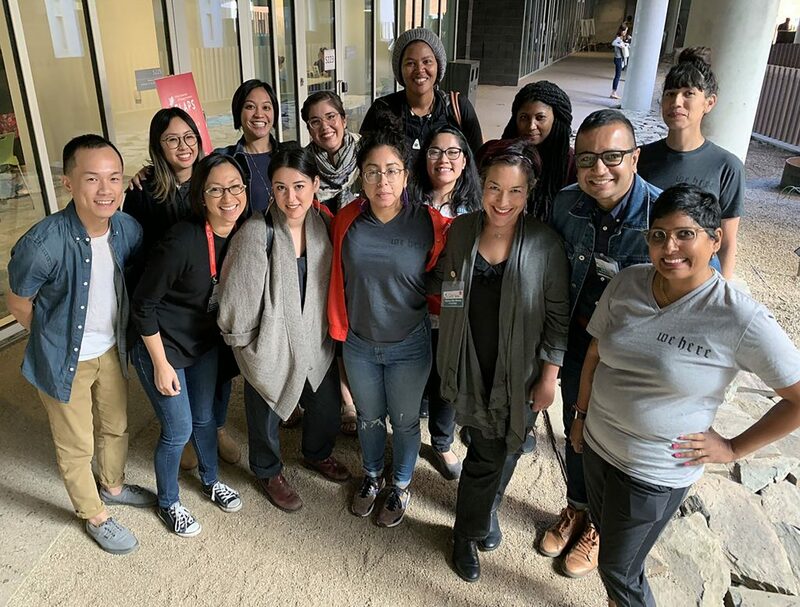 As POC academics #withaPhD, and with shared commitments to feminist politics and non-traditional scholarship, we built a unique partnership over time, starting with and returning to care, collaboration, transparency, and trust as our consistent ethic. + Series on Community and Digital Oral History Praxis and Pedagogy with Edras Rodriguez-Torres (spring and fall): In this two-part workshop series, we introduced workshop participants to the critical and collaborative aspects of oral history methodology, ethics, and recording. Additionally, we worked through a set of pedagogical questions and activities using sample case studies to begin scaffolding expectations and assignments in their courses. In Part 1: Praxis, we shared insights on how to build projects with oral history narratives whilst advancing scholarly commitments to diversity, equity, inclusion, and accessibility. In Part 2: Praxis and Pedagogy, we discussed how narrative and community oral history methods are being used in classroom projects. We utilized course-based examples to understand the ethics and politics of centering voices in and as our anti-colonial pedagogy. + Series on Podcasting with Justin Schell and Nicholas Pandolfi (winter and fall): 1) Learning about Podcasts: History, Processes, and Tools; 2) Producing Podcasts: Ethics of Storytelling; and 3) Teaching with Podcasts: Listening and Learning: In this three-part workshop series, participants learned about the equipments and techniques of creating podcasts, from microphone types and software choices to editing choices and distribution. Additionally, we introduced participants to a set of pedagogical guidelines through which students and instructors could collaboratively develop their own podcasts to reflectively center academic and non-academic community voices. From the delivery of course content and design of classroom assignments to their use as primary texts and adoption as community storytelling aids, we discussed how podcasts are being used to redefine both classroom- and community-engaged learning throughout this series. + Series on Teaching with Wikipedia with Anne Cong-Huyen (winter and fall): In this hands-on session, participants learned why and how we might include a Wikipedia editing assignment in seminar courses. We discussed pedagogical questions, logistics (scaffolding assignments, training students, tracking progress, etc. ), ethics, and ways to frame the assignment, including evaluating public writing with regards to the politics of representation and citation. This workshop also provided a basic introduction to editing Wikipedia, generating wider support and community for complementary edit-a-thons on the one hand, and founding my working partnership with Anne on the other hand. + Tech & Text Series on Maps and Mapmaking with Justin Joque, Nicole Scholtz, and Anne Cong-Huyen (fall): This experimental initiative was conceived of as a discussion series to explore the technologies and texts of mapping histories and everyday cultures. The bimonthly schedule alternated between tech explorations and text-based discussions. Participant learning goals included: 1) Developing familiarity and comfort with mapping tools and critical methods; 2) Finding and building community around anti-colonial critiques and uses of mapmaking; and 3) Exploring pedagogical methods that integrate the texts and technologies of representing data. Throughout the semester, we remained committed to creating a space where we can collectively begin to challenge the representations and continuing impacts of colonial mapmaking. + “The Plot Beneath the Garden,” LSA Instructor of Record, Winter 2018: As part of my postdoctoral fellowship with the Institute for the Humanities, I served as an adjunct lecturer at the College of LSA and taught an undergraduate course on history and politics of Detroit’s community gardens and in coordination with the Oakland Avenue Urban Farm (my community partners). This course met with American Culture, Women’s Studies, and Program in the Environment, and Art & Design. Learn more about my pedagogy and current work in this portfolio post. + “Embracing Voice, Engaging Histories: An Oral History Interview Workshop” for Michigan in the World project, led by Professor LaKisha Simmons (History and Women’s Studies): How might we use the methods of oral history to enrich the learning goals of a community-based academic project? How might we engage students in enriching oral history archives from the ground up whilst also addressing the institutional and ethical questions of who owns that material and how that material might be preserved and accessed beyond the lab or classroom? It was a joy to work with Kisha’s students last spring as they prepared to extend their Bentley archival findings into oral history field engagements involving the social worlds of black women graduates from the University of Michigan since the 1970s (subject specialist librarian collaborator: Maura Seale). + “Life in Former Yugoslavia (The Time before the War) – Inclusive Teaching in Bosnian/Croatian/Serbian” (BCS 231) with Marija Rosic (Slavic Languages and Literatures): Throughout fall semester, my colleague Edras Rodriguez-Torres and I supported the BCS students’ course-based learning in oral history research methods and production in coordination with Philomena Meechan of the U-M Language Resource Center. You can read more about the context of our teaching in this excellent post. + “Connecting Life Stories, Connecting Lives – The Middle East and Beyond” (MIDEAST 295) with Carol Bardenstein (Arabic Literature and Culture, and Comparative Literature): What started as a point of contact during one of my spring oral history workshops continued with course-based collaboration this past fall, where I introduced students to the feminist frameworks of and approaches to storytelling, including the role and value of collaboratively sketching out a vision involving familiar and familial connections (subject specialist librarian collaborator: Evyn Kropf). + “Becoming Digital” (ARCH 409/509) with Adam Fure and Ellie Abrons (Architecture): Conceived as an introduction to digital literacy for students in architecture and the humanities, this course asks participants to reconsider the role and meaning of design in light of networked technologies and related concerns of identity, space, politics, and augmented reality. In this emerging collaboration, I offered course instructors complementary pedagogy frameworks and practices to think with and promote students’ research skills, including, but not limited to, social annotation and play (subject specialist librarian collaborator: Rebecca Price). + “Twine in Two” with Jamie Vander Broek (Librarian, Art & Design): This project-based collaboration involved the development of a Twine game for first-year students of Art & Design. Our semester-long goal was to build a playful narrative and structure that would help achieve the following student-centered learning objectives: 1) develop an understanding and knowledge of library-based resources; 2) practice the skill of finding relevant information within the academic library context; and 3) apply critical judgment when evaluating resources and search results. The game will be published and publicly shared with students and faculty members in early Winter 2019. + In addition to these courses, it was great to engage undergraduate students on their blogging projects for an English writing course on “Food and Culture” (with Supriya Nair); pair-up with Anne Cong-Huyen and introduce students to the narrative possibilities of Twine in a course on “U.S. Culture and Digital Games” (with Matthew Bellamy); and participate in course-based discussions with Matt Lassiter and Jesse Hoffnung-Garsk of the History Lab, discussing the development of their pilot projects on criminal justice and immigrant rights in Michigan, respectively. + “Digital Pedagogies Lightning Talks and Workshop” with Tazin Daniels (Assistant Director, CRLT), May 2018: Have you been thinking about integrating digital technologies, social media, and/or other kinds of pedagogical initiatives using digital platforms into a new or existing course? Would you like to learn about critical digital pedagogy connected to classroom projects in a peer-facilitated setting? In this session, doctoral students in the humanities delivered 8-minute lightning talks on their pedagogical experiments. Participants also interacted with presenters and explored key ideas in break-out sessions after the lightning talks. First developed under the guidance of Professor Sidonie Smith at the Institute for the Humanities during my postdoctoral fellowship year, it was useful to consider the format and audience of this event in light of the Library’s annual Enriching Scholarship week. In this third iteration, presenters included: Secil Binboga (Architecture), Emily Sabo (Linguistics), Marisol Fila (Romance Languages and Literatures – Spanish), and Troy Samuels (Classical Art and Archaeology). + “ScholarSprints” with Diana Perpich (Librarian, Educational Technologies), August 2018: This was the first project that Meghan Sitar (my brilliant supervisor and director of Connected Scholarship) suggested I explore and develop for U-M community with my colleague Diana, and the entire experience has been a joy. Launched in summer 2018, Scholar Sprints offered faculty, instructors, graduate students, and research fellows the opportunity to partner with a team of U-M Library experts on a mini-project over the course of a week. We piloted the program with two projects, one for research with Paula Curtis (PhD Candidate in History) and one for pedagogy with Matthew Woodbury (Postdoctoral Fellow in History). Throughout its design, development, and implementation, Scholar Sprints were guided by a strong commitment to the values of diversity, equity, inclusion, and accessibility. We believe that the expertise of scholars and librarians can enrich the goals and outcomes of a collaborative project. We supported research, teaching, and creative projects that contribute to the public good. We modeled our program after Research Sprints, a faculty support concept developed by the University of Kansas Libraries in 2016. Visit the Scholar Sprints website as well as our initiative’s #Wakelet collection of tweets and experiences to learn more about this process. + Indigenous storytelling and digital media with Michelle Lee Brown: It was such a pleasure to invite Michelle Lee Brown (PhD Candidate in Political Science, University of Hawai’i at Mānoa) to give a talk and facilitate a student roundtable at U-M Library. Michelle’s expertise in the fields of Indigenous storytelling and digital media politics helped to inform our yearlong conversation on storytelling praxis in Connected Scholarship and ScholarSpace. Her talk was entitled, “It’s All Relational: Indigenous Video Game as Storytelling Praxis,” whilst her roundtable discussion centered on imposter syndrome and “#PhDHustleLife.” I first met Michelle in the context of our weeklong course on “Race, Social Justice, and Digital Humanities” in Victoria this year. She was one of the emissaries to our class – there to share with us a short summary of her group’s response to concerns of critical pedagogy, of ethics, inclusion, and marginalization in digital humanities work. Unlike others, however, Michelle had elected to write her response and share it out loud with us. In that narration, she asked us to carefully “uncompress” the discourses on race and indigeneity in digital activisms and scholarship, whilst still analyzing their intersections and overlaps. In that narration, she showed us what it means to adjust for equity in academic spaces. + U-M Center for Research on Learning and Teaching (CRLT): Dr. Tazin Daniels (Assistant Director, CRLT) and I continued to direct the Graduate Teacher Certificate + Digital Media (GTC+) program throughout this year. Our collaboration started when I was a postdoctoral fellow at the U-M Institute for the Humanities from 2016 to 2017. This year we sharpened the goals of this certificate program; revised its overall requirements to align with students’ academic work and diverse ambitions; and developed related programming from within the library, whilst reflecting on the pedagogy goals of our open workshops. GTC+ supports the professional development of U-M graduate students interested in: 1) Developing critical pedagogy that engages in digital practice and inquiry; 2) Building connections across different sectors of higher education, including humanities institutes, university libraries, centers for research on learning and teaching, digital labs, and public scholarship programs on U-M campus and beyond; and 3) Preparing dossiers for faculty and hybrid teaching careers within academia. + My LSA Office of Community-Engaged Academic Learning (CEAL): My pedagogy-based connections with Dr. Denise Galarza Sepúlveda and CEAL have deepened and grown ever since my 2014-15 Engaged Pedagogy Initiative (EPI) fellowship as a doctoral candidate. In my current role, I shared conceptual strategies and critical texts with new and emerging EPI cohorts, served as a pedagogy mentor at annual symposia, as well as consulted with individual students on their individual course designs, exploring the connections between community-based learning and digital pedagogy as they relate to equitable campus-community partnerships across access and privilege difference. + Integrating Digital Pedagogy into Architecture Curriculum with Rebecca Price (Librarian, Architecture and Urban Planning, and Visual Resources Librarian and Liaison for Museum Studies): Building upon our “Architecture in Print” project collaboration and its untapped potentials, Rebecca and I produced a report for the Dean and faculty committee of the Taubman College this year. In this document, we outlined research- and practice-oriented ways to re-imagine the integration of librarian expertise and resources into design studios, seminars, foundation courses, as well as thesis and capstone projects. The question of architecture and its ethical engagement with networked publics and histories remained at the core of our recommendations. This report will be shared with the committee in January. This year was also marked by a number of research and writing projects, many of which will come into full light in 2019. With Blue Buchanan at UC-Davis, I was pleased to have my co-authored piece entitled, “Dodgy Scholars: Resisting the Neoliberal Academy,” published in PUBLIC: A Journal of Imagining America, Volume 5, Issue 1 in August; with Anne Cong-Huyen, I was equally pleased to receive the news of acceptance of our chapter proposal for the forthcoming MLA edited volume on “Mission Driven: Reimagining Graduate Education for a Thriving Humanities Ecosystem” by Stacy Hartman and Jenny Strakovsky (eds. ); with Alex Rivera and Halima Haque (PIC student), I completed an important phase of “Learning with Detroit” research project – the core questions of which originated with my public humanities fellowship at the U-M Detroit Center in 2016; with Naomi Binnie, Alex Deeke, and Anne Cong-Huyen, I was able to think through and develop the conceptual and web-based elements of a digital pedagogy repository of potential value to librarians, faculty members, students, and off-campus community partners; with Edras Rodriguez-Torres, I’ve been working on developing an oral history toolkit for community-based research and pedagogy; and finally, with my students and community partners in Detroit, I am thrilled to be contributing a chapter to “Digital Community Engagement: Partnering Communities with the Academy,” an open-access volume from the University of Cincinnati Press, edited by Jason Heppler, Rebecca Wingo, and Paul Schedawald. Transitioning from a postdoctoral fellowship into the library at the beginning of this year not only enabled me to deepen my connections with existing communities on campus, but also provided other opportunities to establish new connections on and beyond campus. For example, my continuing membership into the Edward A. Bouchet Honor Society allowed me to work on and collaboratively produce a Strategic Planning Committee Report this summer for the enhancement and continuous improvement of the U-M chapter and its related activities. Similarly, serving on the U-M Council for Civic Engagement as a member of the Library’s Connected Scholarship unit provided a forum to reconfigure my connections with people and places along equitable lines, especially as we discussed the present and future of the U-M Detroit Center. Further, it was absolutely humbling to be invited to be a reviewer for the Michigan Journal of Community Service Learning as well as serve on the journal’s advisory board via the Ginsberg Center. Relatedly, it was great to connect back with Antoinette Burton (Director of the Mellon-based Humanities Without Walls initiative) during the “Humanities Collaboratory @ 3” event last term and be invited to serve on a panel for the final Predoctoral Career Diversity Workshop next year. More locally, as an elected member of the Library Diversity Council, I worked with my thoughtful colleagues and planned our very first Equity Forum in fall; a forum where we invited members of the university library to share their thoughts and questions regarding the practices and experiences of equity in this organization. Our goal is to use this feedback to guide efforts to lobby for a more equitable workplace. In terms of staff training and professional development, I worked with fellow members of the Library Instructor College and planned individual sessions on assessment (with Amanda Peters) and critical pedagogy (with Maura Seale) respectively. Last semester, as part of my work with the Citation Management Service Team, I also partnered with Carol Shannon and Hailey Mooney to develop the forthcoming session on “Citation Management Training for Research and Instruction.” The structure and goals of this session follow the recommendations and results of our Citation Management Service Design Teamwork during spring semester. Nationally, my work with Imagining America saw the coming together of a number of community-engaged projects, namely, PAGE @ 15, Organizing Against Violence, and IA Task Force Visioning and Planning. Similarly, my involvements with DHSI shaped my ongoing collaborations with Ashley Morford and Arun Jacob around anti-colonial DH pedagogies. Ashley, Arun, and I are excited to take this work across the continent to different forums, from Global DH to HASTAC, and conduct workshops, deliver paper presentations, and facilitate course-based engagements in 2019 and beyond. This year, I also gained new community support through participation in the 2018 Digital Pedagogy Lab, DLF forum, and CLAP symposium respectively. The highlight of each of these engagements was meeting folx and collectives whose work I deeply admire in real life. As I close this year and review a full year of inspiring projects and community collaborations, I am reminded of Shannon Mattern’s call for action in the “Outrage” column of Architectural Review, December 2018/January 2019): “The cultivation of an educated public is a life-long communal responsibility … Epistemic and cultural ‘warfare’ is bigger than each of us: institutional, national, geopolitical. 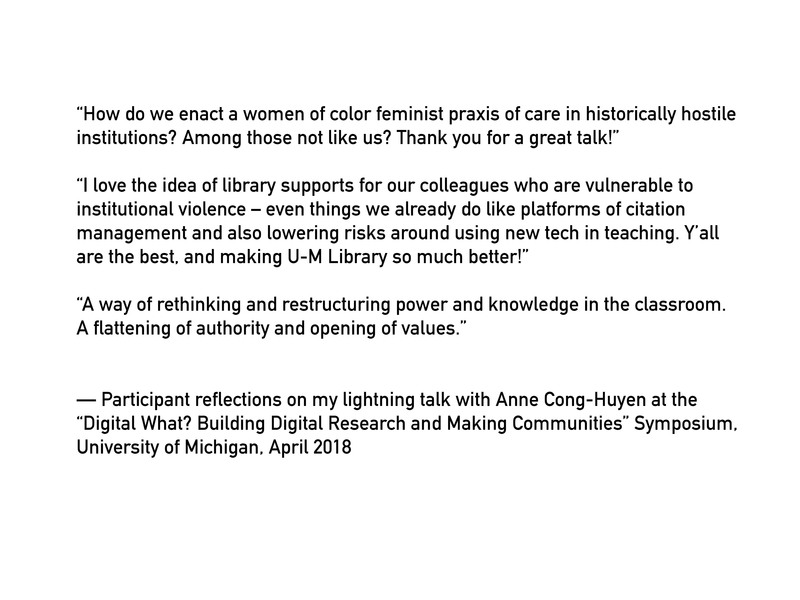 It requires a public defense, perhaps one launched from the book stacks and circulation desk.” It’s been an honour to have had a renewed understanding of this power in and through my role as digital pedagogy librarian this year. Equally, it’s been wonderful to have the leadership of my organization embrace this practice and politics as nested within my broader and continuing commitments to public scholarship. There are deep structural inequities in academic labour and tenure models that will not be resolved overnight, but for these care-based networks, I’ve been able to build and maintain a hybrid relationship to higher education since my pre-doctoral years; a relationship, which aligns with and honours my queer identity, feminist politics, and deep connections to kin. On that continuing note, welcome 2019!